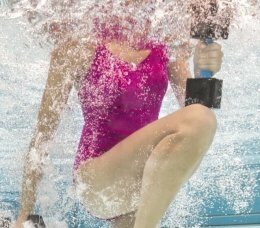 Are you new to water aerobics, wondering about the benefits, or want some tips on how to get the most out of your current water aerobics workout? The experts from SwimAndSweat can help. This intro to water aerobics will help you gather the essential kit for taking your first class, and guide you through a very helpful warm-up for beginners. Just step into the pool and immediately, you’ll feel 10 pounds lighter. That’s the effect of buoyancy. On land, we have gravity pulling us down. In water, we have buoyancy pushing us up. Buoyancy makes water exercise not only low-impact, but also ideal for stretching and improved mobility. Water’s cushioning effect allows movement that might be painful or even impossible to do on land feel good. But it’s also a workout! Working against resistance can boost heart health, increase strength and improve the health of joints affected by arthritis. If you’re new to water aerobics, you’ll need a few things to get started. Bathing suit – if you’re going to make water aerobics your preferred choice for health and wellness, chlorine-resistant swimwear is essential. You’ll want a suit that is both comfortable and supportive. If exercising outdoors, consider a UV protective sleeve shirt to block sun or help keep you warm. Water shoes – are highly recommended. Aqua shoes absorb forces, improve traction, and add resistance. Wearing water shoes reduces joint loading, especially if you have joint pain, and better grip allows you to easily change from one more to the next. Aquatic shoes also prevent slips and falls in and around wet and slippery pool surfaces. In addition, water shoes can even add resistance! Get more out of each exercise with added resistance. Water bottle – staying hydrated during your workouts is a must! Did you know that immersion reduces your body’s natural thirst mechanism and increases urinary output? This combination can be a quick road to dehydration. Make sure to drink plenty of water. If you cannot drink during the workout, be sure to hydrate afterwards. Towel – to dry off after your workout. Find a depth that is comfortable. Even an inch or two can make a big difference. I recommend trying cardio exercises at chest depth and stretching and strengthening in shallower water. Standing at chest depth you are 25% weight bearing. Stress is reduced on the joints during whole body moves such as jogging, cross country skills and jumping jacks. For higher impact, simply move to shallower ground. At waist depth, you quickly add a greater load to the joints, which now bear 50% of your body weight. Try your stretching and strengthening moves in shallower water where you’ll have better control. Remember: the water is always moving around you. This is great because you are training your core during 100% of the workout. Keep in mind, however, that when you’re first getting started, you need to find your ground. Test out the difference slight variations can make in the control you have, and the amount of work you feel in order to find your ideal working depth for each exercise. Once you’ve got the gear and found your depth, it’s time to prepare your body physically for the workout ahead. Did you know that people over the age of 50 often lack ankle mobility? This lack of mobility reduces the ability of the muscles to generate power for even everyday tasks, including walking and getting up from a chair. You can improve ankle mobility as well as hip and leg strength using 7 basic foot positions. Try this 4-minute warm-up to get your ankles and hips moving in natural directions. To conclude your warm-up, select the foot position (or combination) that you’d like to do more of and repeat for 1 minute. This winning-warm up will prepare your body to achieve better results from any water workout program. Jump in, have fun, and get fit. What are you waiting for?